You are at:Home»January»January 30»January 30, 1703: 47 Ronin Get Revenge! January 30, 1703: 47 Ronin Get Revenge! On January 30, 1703, 47 Japanese samurai avenged the forced suicide of their feudal lord. 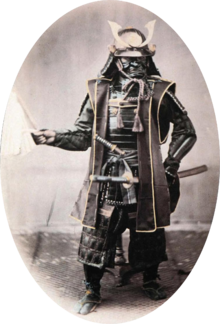 Digging deeper, we find that the Japanese code of Bushido was an Eastern code of honor similar to the old European code of chivalry. Japanese samurai in armor, 1860s. Photograph by Felice Beato. Samurai who became leaderless were called Ronin (a term made memorable by Robert DiNiro in the 1998 movie Ronin, set in modern times) and were bound by honor to avenge the death of their lord and leader. 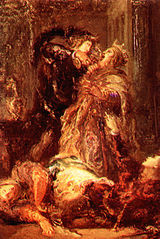 The 47 Ronin at the center of this incident were left leaderless when their lord was forced to commit suicide after having assaulted a powerful court official in a fit of anger after having been insulted by him. These 47 Ronin plotted for 2 years before finally carrying out their honorable obligation. Two of the Forty-Seven Rōnin: Horibe Yahei and his adopted son, Horibe Yasubei. Yasubei is holding an ōtsuchi. Print by Utagawa Kunisada (1786–1865). On January 30, 1703, the assault finally took place on the official’s estate. When the official refused to die by seppuku, a ritual suicide, he was beheaded, and the honor of the 47 Ronin was upheld. One of the Ronin was tasked with spreading the word of the successful vengeance in their home territory, and the remaining 46 turned themselves in to answer for the murder of the official. Their plan included committing seppuku, which they were allowed to do after being sentenced to death. The wife of one of the 47 ronin committed the female version of seppuku to follow her husband in death. The young Ronin messenger sent to notify their Lord’s home territory was spared and did not die until 1747. The Japanese public almost immediately took the story of such fierce loyalty and sense of honor to heart, and in the many years since, this incident has been commemorated in numerous plays, stories, television specials, movies and even puppet shows! Critics note that this tale of Bushido has been exaggerated and warped to present a false picture of feudal life, with the intention being to inspire a fatalistic and fanatic fighting spirit in the Japanese military during World War II. Still, as is true with most legends, the romantic interpretation is the most popular, and the general feeling is still one of veneration for these 47 Ronin. 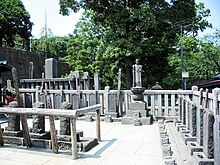 Graves of the forty-seven rōnin at Sengaku-ji. Photograph by Stéfan Le Dû. In 2013, 47 Ronin, a movie loosely based on this incident and starring Keanu Reeves, was released. 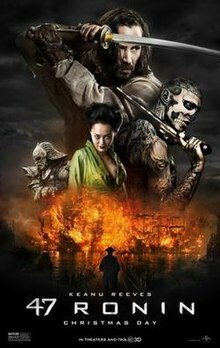 Only time will tell if the sequel to this movie will be named 48 Ronin! Question for students: When, if ever, is revenge justified? Allyn, John and Stephen Turnbull. 47 Ronin. Tuttle Publishing, 2012. The featured image in this article, the rōnin attacking the principal gate of Kira’s mansion by Katsushika Hokusai (1760–1849), is a faithful photographic reproduction of a two-dimensional, public domain work of art. The work of art itself is in the public domain for the following reason: This work is in the public domain in its country of origin and other countries and areas where the copyright term is the author’s life plus 100 years or less. Previous ArticleJanuary 30, 1661: Oliver Cromwell Executed Two Years After Death! Next Article January 31, 1747: The First Venereal Disease Clinic Opens, or How Columbus Brought VD to Europe!